SHOP NOW FOR GREAT DEALS! 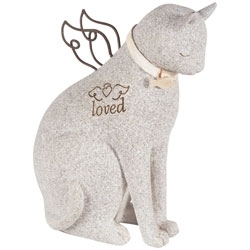 This beautiful angel cat figurine stands 4"" H x 4" W x 2.25" D and is a loving reminder of your faithful friend. Hand painted resin, with slight color variations give it the look of stone. Makes a wonderful, thoughtful gift as well for someone who has lost their beloved pet.